I am that person that lives out of her purse. I lean towards oversized carry-all purses that can hold so many things at once that I often lose my hand in their depths. As someone perpetually on the go, this habit is a life saver. Need a pen? Check. Need a some propel mix for my water? Check. Need a water bottle for that water? Check. Need a book about Andrew Jackson? Check. Some iphone cords? Check. Three pairs of headphones, two of which are broken? Check. Every receipt from the past three months? Check. Okay, maybe it’s half a life saver and half a bottomless pit of junk. Either way, one time that this obsession with shoulder-hung space is handy is the movie theater. When I was in high school there was a place right next to the movie theater that made the most amazing kung pao chicken over noodles. I would get it to go, hide it in my purse strategically under other objects, and enjoy it during the movie. Over the years I’ve snuck everything from the expected Twizzlers to oversized burritos into movie theaters, all with the same result- one happy viewer. Mix together butter, egg, sugar, and vanilla. Stir in flour and baking soda. Stir in chips. Cover a baking sheet with wax paper. Spoon out teaspoon sized dollops. 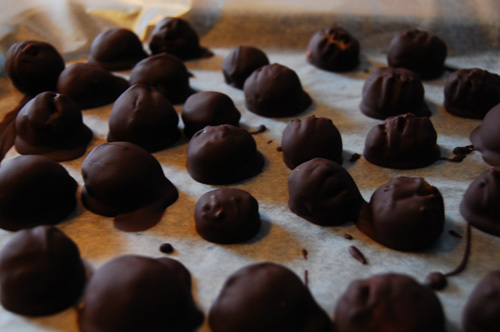 Don’t worry about them being too ball-shaped right now, you can form them later. 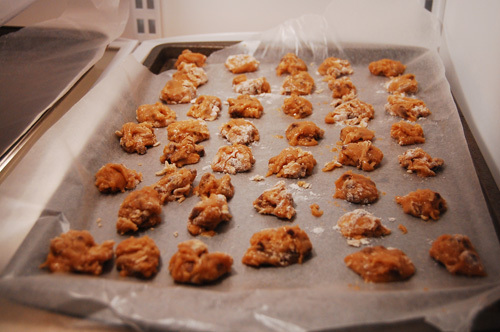 Refrigerate 1 hour. 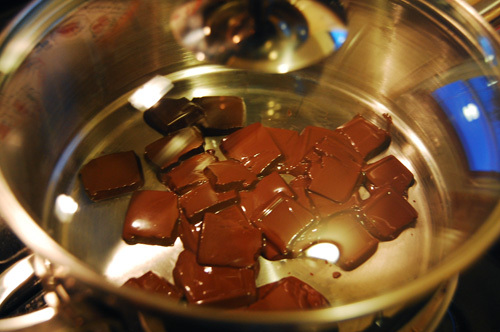 About 20 minutes before your dough is finished cooling, break the chocolate into chunks and melt in a double boiler. 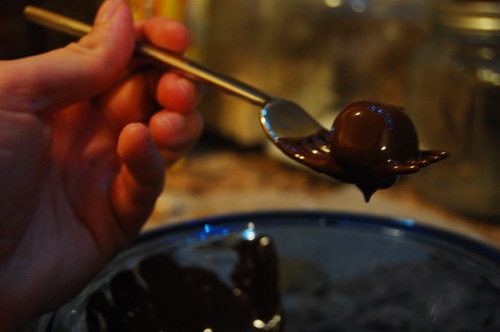 When it is melted, pour into a bowl. Remove your dough from the fridge. Spread out a second sheet of wax paper. Form each piece of dough into a small ball. Dip into the chocolate using forks (it’s too hot for fingers!! ), tongs, spoons, or whatever tool you have accessible. Coat the ball entirely and then place on the wax paper. Refrigerate 2-3 hours, then serve.